BLACKFIRE Paint Sealant can be applied by hand or with a DA or orbital polisher. BLACKFIRE Paint Sealant is a premium paint sealant designed for the perfectionist. It creates an extremely slick finish and incredible depth with a revolutionary blend of three incredible polymers.� Sourced from Germany and Switzerland, these polymers have a protective quality and depth of gloss that surpassed all others tested. 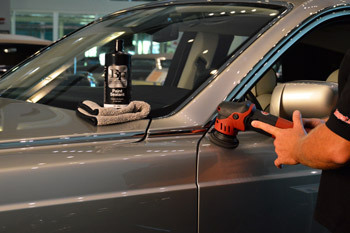 BLACKFIRE Paint Sealant refracts light, similar to a diamond, to create a vibrant, super slippery, head-turning finish. BLACKFIRE Paint Sealant is the state-of-the-art paint sealant. The tri-polymer system results in a true blanket of protection on your paint. It is almost impenetrable to environmental fall-out and contamination. The increased surface area of active polymers creates a microscopically level surface that reflects light across the spectrum and creates a super slick surface with little drag. You can feel the Wet Diamond polymers at work. Because each of the Wet Diamond polymers reflect and refract light differently, you are left with a look that is unique and without compromise. We have achieved the depth and shimmer (created by bending the light) of a carnauba wax, while maintaining the characteristic high-gloss shine of a paint sealant. But the unique dripping wet look of BLACKFIRE Paint Sealant is only the beginning of the story. The Wet Diamond polymers form a tight matrix of protection on the surface of your vehicle. This sealant has it all: looks, durability, and the ability to protect your paint from acid rain, bug remains, contamination, environmental fallout, and water spots. BLACKFIRE Paint Sealant is further boosted with Polycharger for maximum shine, slickness, and longevity. BLACKFIRE Paint Sealant can be used by itself as a final sealant or as the foundation of BLACKFIRE's signature Wet Ice Over Fire shine. 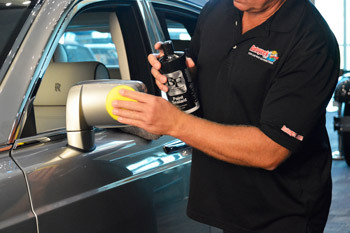 Apply BLACKFIRE Paint Sealant by hand or dual-action polisher using a soft applicator pad. Apply a thin even coat over the entire surface and allow to dry to a haze. Hand buff to a brilliant shine with a microfiber towel. For best results, clay the paint first with BLACKFIRE Poly Clay and polish with BLACKFIRE Paint Cleaner or BLACKFIRE Polish.